Archival pigmented inkjet with acrylic, 44 x 30 in. Magnolia is pleased to announce the publication of new works by innovative and genre-defying composer, performer, visual and sound artist Guillermo Galindo. This series represents an ongoing collaboration with photographer Richard Misrach, directly incorporating artifacts found at the border between the United States and Mexico by both artists. 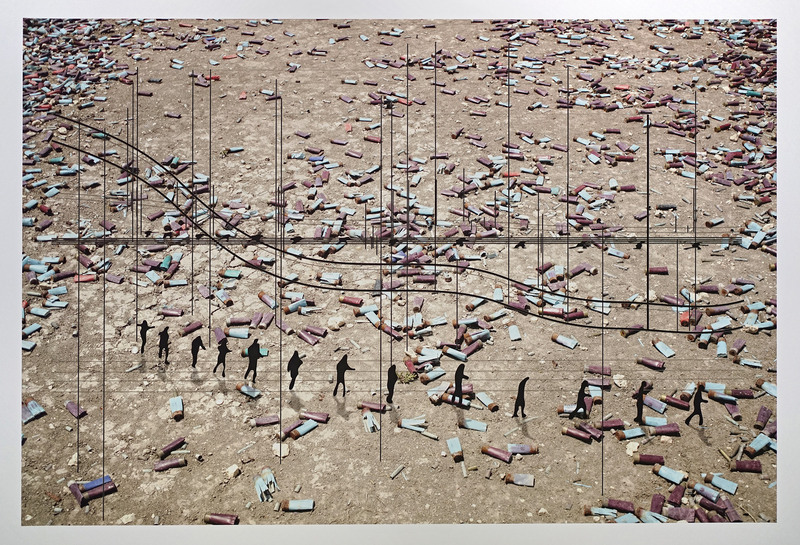 The prints will be exhibited for the first time in an upcoming show at the San Jose Museum of Art, "Border Cantos: Richard Misrach | Guillermo Galindo," opening in early 2016. Acrylic on beacon flag used by humanitarian aid group Water Stations. 30 x 47 in. 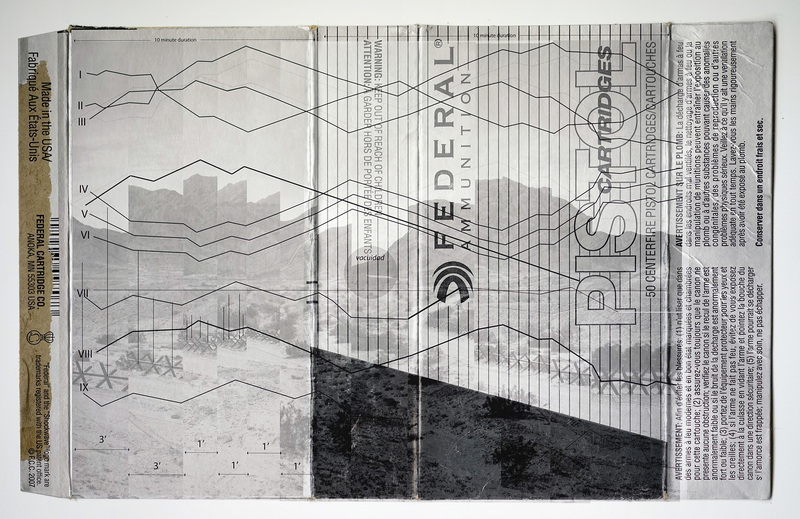 Galindo’s Flag series are printed directly onto a group of faded, weathered flags from the border. Donated to the project by the humanitarian citizen organization Water Stations, these discarded flags were once used to indicate the presence of water tanks placed in the Calexico desert. Their placement in the desert is a selfless endeavor – an anonymous effort to aid those in need, with no reward sought in return; as a result, their frayed surfaces are imbued with a poignancy and a humanistic warmth. 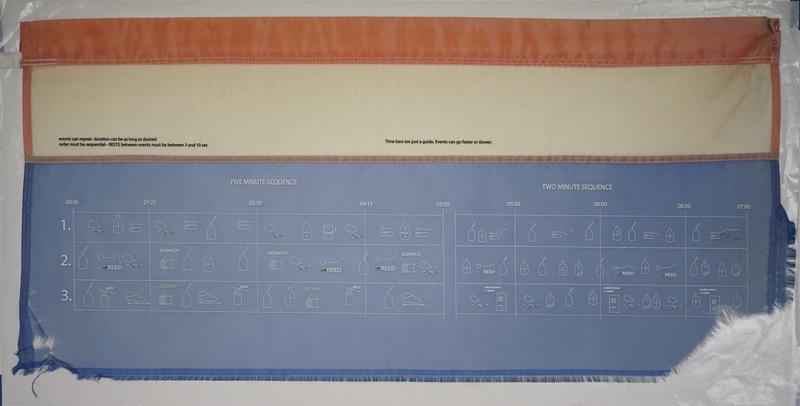 Archival on beacon flag used by humanitarian aid group Water Stations. 30 x 47 in. On the other hand, the deadly dangers of crossing the border are evident in ominously empty boxes of bullets, reproduced at an enlarged scale in Galindo's Ammo Boxes prints, and in Color Caravan’s background: a photograph taken at the border by Misrach of a swath of desert littered with spent shell casings. In Caravan, a parade of tiny figures marches across this field; are they the ghosts of those lost in the gunfight, or a party of indomitable spirits, determined to press on? Archival pigmented inkjet print, 33 x 40 in. 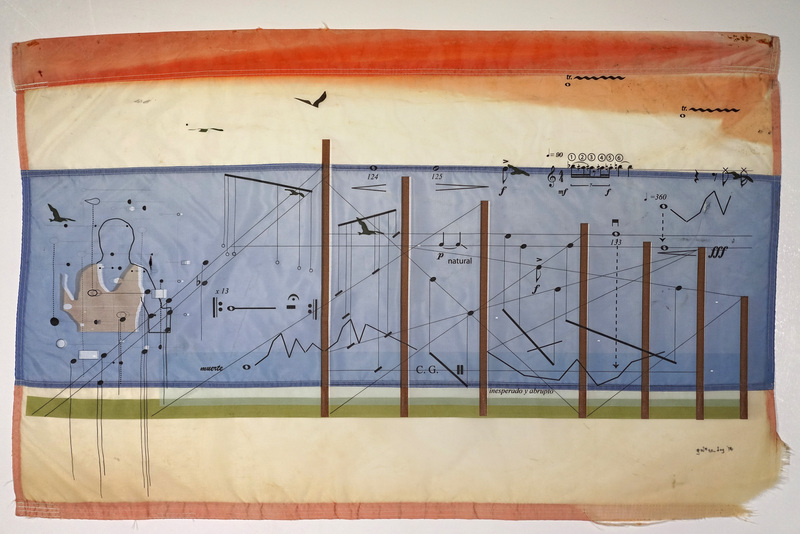 The surface of each image is traversed by one of Galindo’s signature musical scores, printed in a variety of unique systems of notation that recall the graphic scores of John Cage, Cornelius Cardew, and Karlheinz Stockhausen. Acrylic on beacon flag used by humanitarian aid group Water Stations. 22 x 47 in. 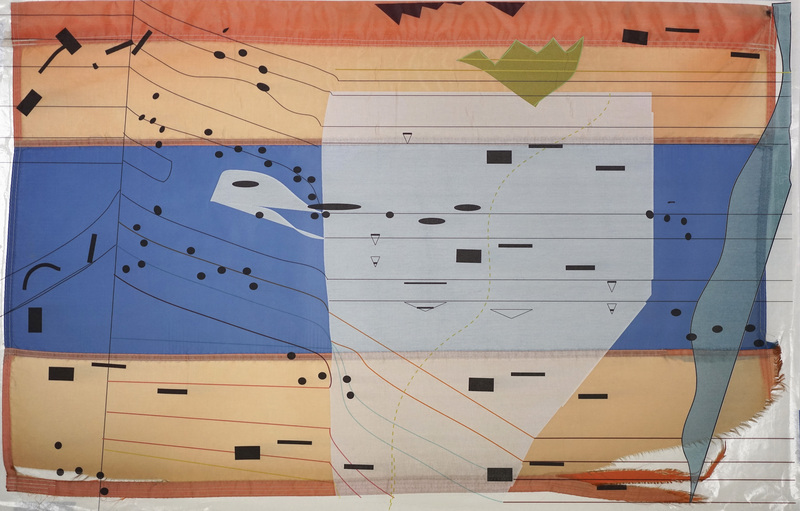 These systems of musical notation cause each print to vibrate at its own distinctive visual frequency: where Bandera de Voces / Voices Flag is crisply printed with straightforward, rebus-like instructions for a performance, Rastreo de Sarape / Sarape Tracking Flag’s abstractions of line and color approach the playful improvisations of a Joan Miro painting. Acrylic on beacon flag used by humanitarian aid group Water Stations, 33 x 40 in. Galindo’s practice often incorporates playable instruments he has fabricated from objects found at the border. 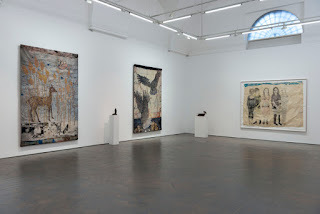 Here, too, he uses the rhythms and patterns of music — as filtered through various inventive modes of visual representation – to elegantly summon a living history from that which has been discarded and forgotten. 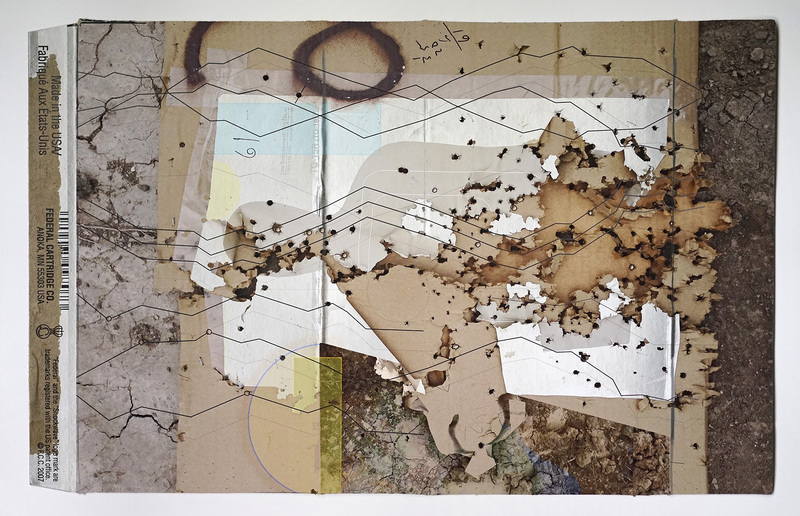 Archival pigmented inkjet print, 30 x 44 in. 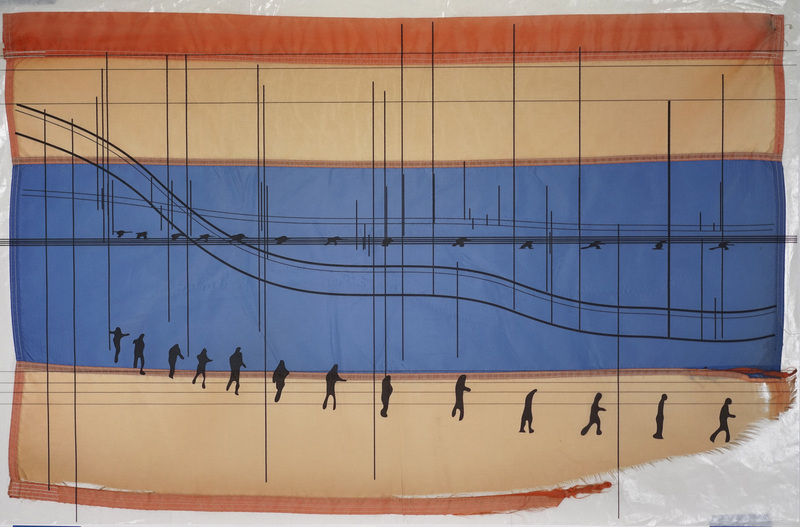 Galindo and Misrach's upcoming "Border Cantos" exhibition at SJMA is described by the museum as "a cross-disciplinary exploration of the U.S.-Mexico border." In addition to several of the flags and works on paper shown here, it will also include monumental landscape photography by Misrach and hand-crafted musical instruments created by Galindo. After premiering in San Jose, the exhibition will travel to the Amon Carter Museum of American Art in Fort Worth, Texas with additional venues pending.